This is an extension/continuation from the blog post on how to create a basic Python webapp. 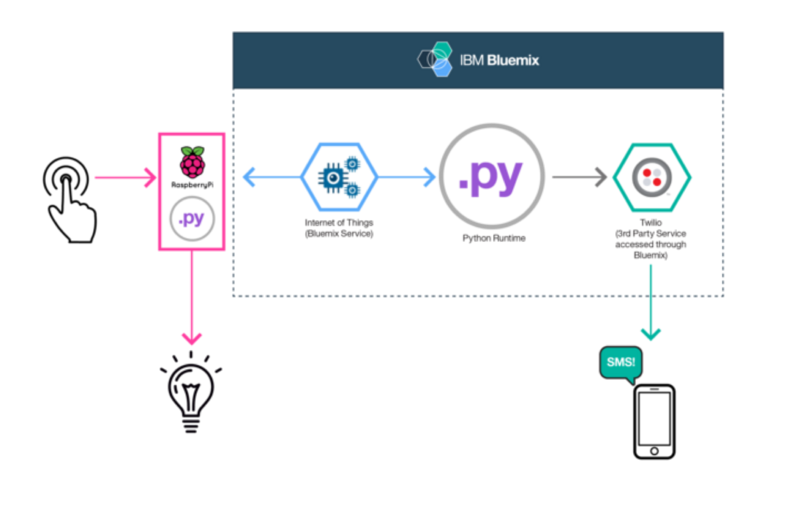 In this tutorial we are going to go through how to integrate a Python Flask webapp in Bluemix with the Internet of Things Foundation in Bluemix with a Raspberry Pi and two sensors on the Raspberry Pi. 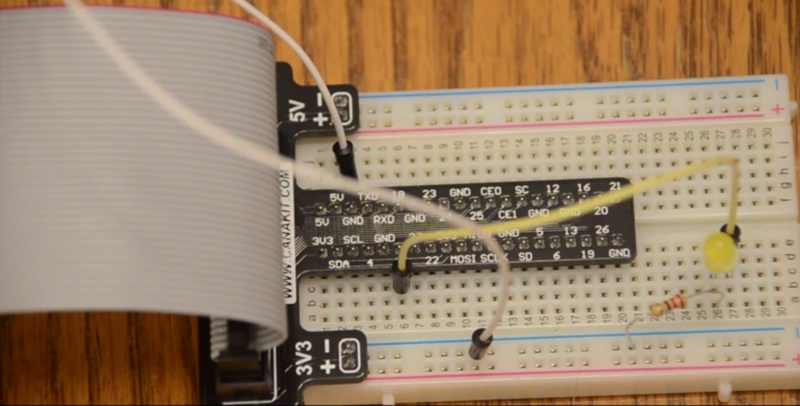 The tutorial also uses Twilio to interact with the Raspberry Pi. So what does this look like? Here is a simple architecture diagram. The first flow involves pressing a HTML button in the Python Flask app in Bluemix to either turn on or off an LED on the Raspberry Pi. The second flow involves pressing a physical button on the breadboard on the Raspberry Pi and using the IoT service in Bluemix and our app in Bluemix it will send a text message of our choosing to a phone number we enter in the Python Flask app in Bluemix using Twilio. This all took only about 100 lines of code, pretty cool huh? If you prefer to watch a video of this instead of going through the written steps in this tutorial, check out the video below. There is two parts to setting this up. If we take a look at the architecture diagram above we see that there is a Raspberry Pi piece and then a Bluemix piece. We are going to go through the Raspberry Pi piece first then we will go through the Bluemix piece. Wait for an email to arrive, it should only take a couple minutes. There should be a link in the email that says “Click here to complete your registration”, click that. Sign in with the username and password you created from step 1. 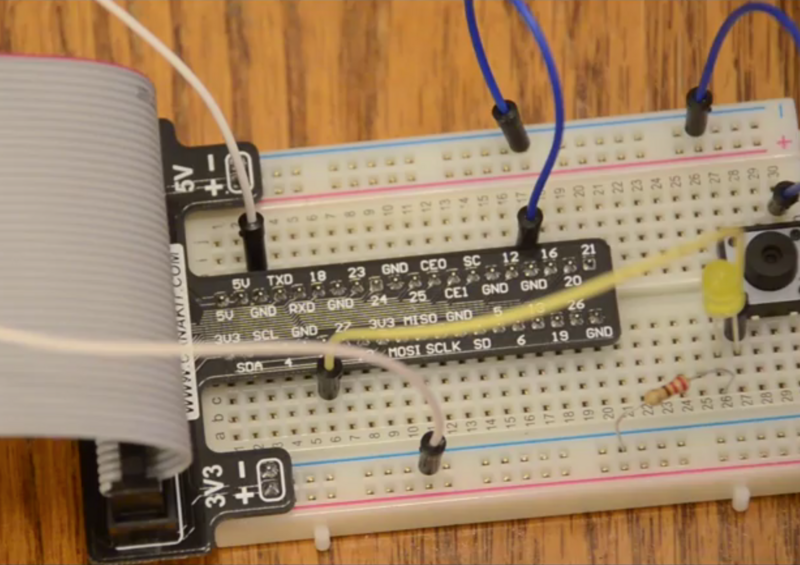 On the right side of the LED, connect a wire to the the port labeled 17.NOTE: The way the breadboard works is connections run vertically not horizontally. 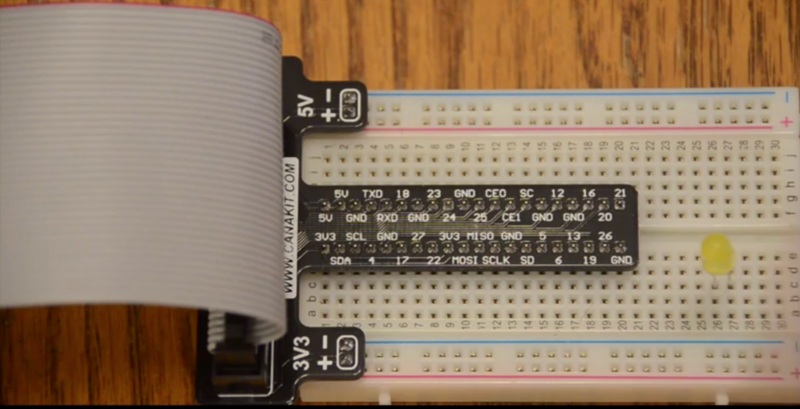 Place the button in the breadboard, it takes a bit of force to press it in all the way. It won’t break it. Connect a wire from the right side of the button to the ground rail. 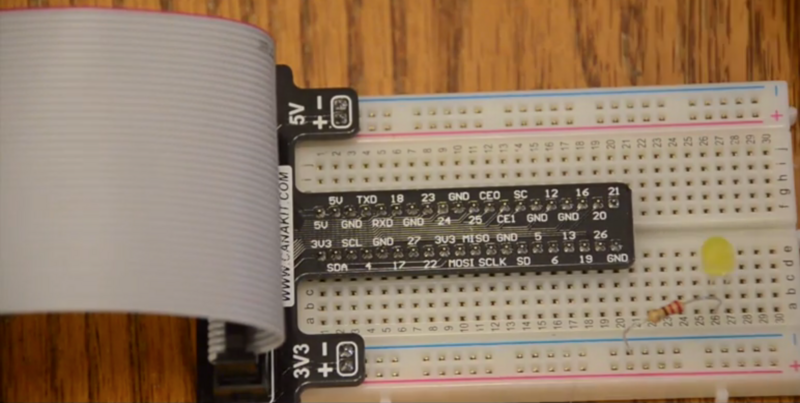 Lastly, connect a wire from the left side of the button to GPIO port 18. Next we need to either use the console for our Raspberry Pi and the terminal application on the device itself or use SSH. I am going to use SSH. Open up a web browser and goto bluemix.net, and click on “Catalog” in the top. Scroll down to the very bottom and click “Internet of Things”. Give the service a name, use iot-python (you must do this exactly or later things won’t work), for App choose “Leave unbound”, click “Create”. On the left of the next page click “Launch dashboard”. At the top click on “Devices”. For the second field (it says e.g. mydevice type) type in exactly raspberrypi (you need to have it spelled like this or there will be issues). For device ID paste in the device ID we got from step 20, mine is b827ba5b236. Click continue. On the next page it will show something like below, copy this and switch back to terminal on your Raspberry Pi. Choose your favorite text editor but I am going to use vi. Type the following to open the file we want to edit. To paste the text press the “i” key. Then paste the text, this will depend on the OS you are on. To save the file hit the “Esc” key. Then Type “:wq” and then press “Enter”. That will save the file. NOTE: The following steps are to be run on your desktop NOT the Raspberry Pi. We will need to install the Cloud Foundry CLI to deploy our app to Bluemix. To do this head over to https://github.com/cloudfoundry/cli/releases. Choose the appropriate installer for your platform, download it and run the installer. So let’s open up a new terminal Window, we will need to do the rest on our development machine/laptop. We need to download the Python code for our app. Run the following. If you don’t have git installed follow these instructions here. In your web browser go back to the tab that you have Bluemix open with. In the top click “Catalog”, scroll down to find “Twilio”. Click on that. If you already have a Twilio account and want to use that skip to step 6. If you don’t have a Twilio account on the right hand side click “Register at Twilio”. Twilio will ask you for some information and you will need to verify your phone number. This is important as only numbers verified with the free plan will work with your app. If you want to be able to text any number you need to pay for Twilio, its $1/month/phone number. Once you are signed up for your account, head to https://www.twilio.com/user/account/voice-messaging. Near the top right there will be a twistie that says “Show API Credentials”, click that. There is two pieces of information here, the Account SID and Auth Token. We will need to copy these back to the Bluemix tab we have open with Twilio. Paste your Account SID in the field in Bluemix that says Account SID, paste your Auth Token in the Auth Token field. Switch back to the terminal that you have on your local dev machine, not your Raspberry Pi. We need to login to Bluemix, to do that, type cf login -a https://api.ng.bluemix.net. It will ask you for your username and password. This is from step 1 in the Raspberry Pi section above. To deploy our application all we need to do now is type cf push myappname where myapp name is a unique name you choose for your app.NOTE: If you get an error mentioning a route is taken, choose a different name and run cf push with a new app name. There is a row that says urls:, copy that URL and paste it into your browser. An important note here, do not press the button on the Raspberry Pi until you enter a phone number and text message here, if you do the app will crash. If you do this you can restart you app with cf restart myappname, where myappname is the name of the app you chose above. When you click the “On” button it should turn the light on for you. If you press the “Off” button it should turn the light off.